Once again, our thanks go out to Miguel Ángel Nepomuceno, for more wonderful coverage of the Alatriste premiere in León. This time it is photos. I would same that the word of the day was pandemonium. © Diario de León. Images © Norberto. Used by permission. Our thanks to mkculb for sending us the videos of speech in Oswego. The file is HUGE so she split it into five sections...but it is all there. © mkculb. Images © Alma. I had the chance to spend some time this afternoon on the phone with Linda Sandri from Dr. Bob's campaign and she wanted me to pass along the message that the three Viggo/Dr.Bob events in upstate New York were all a success, both in spreading the word about Dr. Bob's candidacy and in raising funds to support his run for the 23rd District House seat. She said that all three events had their own personality and were very informative, productive, well-attended and inspirational. All of the events' organizers and coordinators (including Viggo) were very tired after the last event, but it was a good kind of tired where they felt they had accomplished a lot. As if you didn't know, she found Viggo to be very gracious, funny, and focused on the events. Many of us would have loved the silent auctions where they auctioned two of Viggo framed pieces among many other things. I am green with envy to have not been able to bid...especially on the one with TJ. While we congratulate them all on their three day barnstorming efforts, we know that the hard work in the trenches goes on. Kudos to them all. If you ever wanted an example of people making a difference...this would be it. 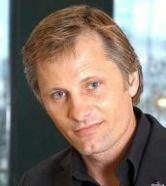 WATERTOWN, N.Y. (AP) _ Actor Viggo Mortensen. A 2006 Toyota Prius. A three-day, 450-mile fundraising tour. It was an unusual campaign last week for a North Country doctor in his run for Congress. Mortensen, a Watertown native, joined Robert Johnson on the campaign swing across 11 counties to speak out against America's dependence on Middle Eastern oil. "People are still going to need cars," said Mortensen, star of the "Lord of the Rings" trilogy. "It's not a question of making less cars, it's a question of making more fuel-efficient cars." Mortensen helped Johnson raise about $16,000, plus $3,900 in two silent auctions that offered signed copies of Mortensen's films and books. "He has brought our message to the electorate, and that's what we needed," Johnson said. The Democrat is challenging Rep. John McHugh for the 23rd Congressional District seat. © Copyright 2006. Watertown Daily Times, Inc., Watertown, NY. All rights reserved. Our thanks to Alma for the great photos and article from last night's Viggo/Dr. Bob event in Oswego. The article appears in today's issue of The Palladium Times. Please contact Alma for poermission to post her photos elsewhere. 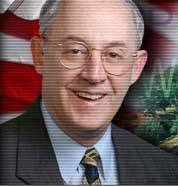 Dr. Bob Johnson, the Democratic candidate for New York's 23rd Dist. seat in Congress, held a fundraising gala in Oswego Friday evening. 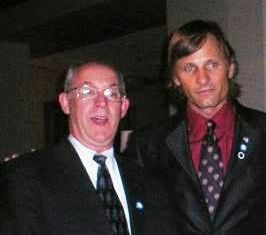 Featured speaker for the evening was celebrity Viggo Mortensen. Mortensen, best known as an actor for his role in films such as Lord of the Rings, Hidalgo, and History of Violence, is also a writer, poet, artist and musician. He came to Oswego as part of a three-day speaking tour to help Johnson's campaign. Johnson is running unopposed as the Democratic candidate. He is a thoracic surgeon in Watertown and lives in Sackets Harbor. He faces Republican incumbent John McHugh, from Watertown. Mortensen, also from Watertown, says he has a 'soft spot' for McHugh because they share a hometown, but added that that's where the similarties end. That's why Mortensen was making the effort to help Johnson's campaign, including the guest appearance Friday in Oswego. The gala was held at The American Foundry, as a $75-a-person fundraiser. Mortensen also brought a number of personal items with him to 'sell' in order to help fund Johnson's campaign. Mortensen drove himself to Oswego in his own car ... no limousines or chauffeurs. Johnson has been campaigning as a non-typical, antithesis of a candidate. He refuses to accept PAC (political action committee) money, and 95 percent of his contributions are from local people. Johnson also has a number of ideas that are different. Mortensen said he was impressed with Johnson because he didn't need to get involved in politics. He did it because he believed one person could make a difference. The same could be said for Mortensen. He didn't have to get involved in Johnson's campaign. He did it because he wanted to make a difference. © The Palladium Times. Images © Alma.